Made with a homemade vegan mozzarella that only takes 15 minutes to make. 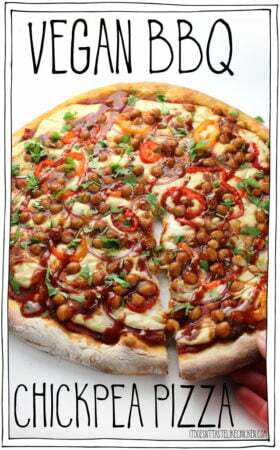 Layered with spicy and smoky BBQ chickpeas for the ultimate hearty cheeseless pizza. Prepare the Melty Stretchy Gooey Vegan Mozzarella according to the instructions but add in an extra 1/3 cup of water to the blender. When you cook the cheese, it will be less gooey than normal which will make it easier to spread on the pizza. In a small bowl mix together the chickpeas and BBQ sauce. On a lightly floured surface, stretch the pizza dough until it fits the pizza pan. Spread the tomato sauce evenly across the pizza dough. Pour the cheese on top of the tomato sauce, and use a spatula to spread it evenly. Top the pizza with red onion, banana peppers, and the BBQ chickpeas. Bake for 18 to 22 minutes until the crust is golden brown. Remove from the oven then garnish by adding an extra drizzle of BBQ sauce across the pizza and sprinkling with cilantro. If you have a copy of Fuss-Free Vegan cookbook you can find recipes for many of the ingredients in this pizza if you would like to make them from scratch. Store-bought also works fine. Life Changing Mozzarella (page 200) -both mozzarella recipes work great here so whichever you prefer.